Shifting Gears sold as Lot 1 in the 2017 Las Vegas National Finals Angus Sale. He's the number one, non-parent, calving ease and growth bull in the entire Angus breed. 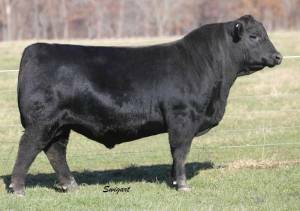 He is the only bull in the breed with a +17 CED -3.4 BW and 128 YW. 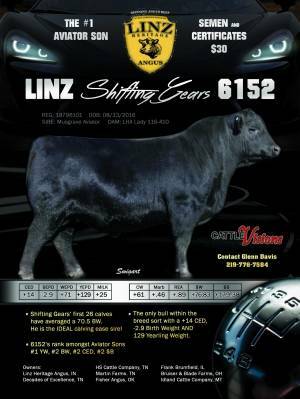 Shifting Gears is the #1 Aviator son for BW, YW, $F, $B, CW, and CED. He had 41cm testicles at 1 year of age and froze 155 units on his first collection.